The 9th Annual Space Generation Congress (SGC) hosted by the Space Generation Advisory Counsel (SGAC) was held in Prague, Czech Republic, from September 23 - 25, 2010. Being a complimentary event preceding the the 61st International Astronautical Congress, this congress started with a record high of 200 top and carefully chosen delegates gathered together to discuss the latest issues in the space industry. 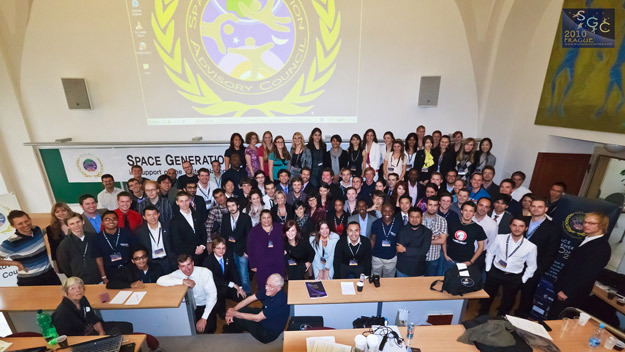 With five concurrent workshops at its core, in conjunction with talks by distinguished members of the space industry, SGC 2010 was very successful in reaching its goal of creating a forum to bring together and facilitate the voice of innovative, creative, and passionate students and young professionals on space issues, particularly at the international level. Over 220 students and young professionals from around the globe applied to participate in SGC2010. One hundred delegates were chosen from 40 countries, 28 of whom received grants and scholarships to attend the congress, and an additional 10 who received the IAF grant. Setting a record high for SGAC, this was a significant increase in numbers from 2009, which saw a participation of 75 delegates representing 32 countries, 21 of whom were granted scholarships. As with previous years, the delegates brought knowledge and experience from many fields, from engineering, law, policy, marketing, business development, journalism, to astrophysics, biology, geology, education, and many more. They were divided into five working groups where they discussed, analyzed, and made recommendations on key space topics of: Agency, Climate, Exploration, Industry, and Outreach. The Agency Project Group discussed past disaster managements systems, identifying limitations, types of information required, and processes to develop a successful system. The group discussed the specific application of Global Navigation Satellite Systems (GNSS) for different disaster phases, with consideration of technical and policy challenges and possible solutions. The Climate Project Group debated existing climate and weather monitoring technologies, data and metadata collection standards, contribution and responsibilities of nations, taking into account the underlying social and economical issues. They also evaluated international principles of remote sensing and Earth Observation, and issues related to sovereignty, global commons, and national security. The Exploration Project Group evaluated human exploration missions to the Moon and Mars. They discussed necessary technologies needed for a Mars mission, taking into consideration financial, political and outreach issues involved. They categorized and prioritized the results to create a roadmap of challenges implied by a mission to Mars and possible solutions to these problems. The Industry Project Group analyzed commercial space applications including remote sensing, space transportation, space applications, and International Space Station (ISS)-related opportunities. They performed a SWOT (strengths, weaknesses, opportunities, threats) analysis on a select number of these applications, taking into account factors such as economical, market demand, legal, as well as political and governmental influences. The Outreach Project Group evaluated current perception of space in the public eye, with influences from media, community, and other sources, to determine ways to encourage the young generation to become involved in space. They developed strategies and frameworks for possible outreach programs, including promotion of space activities in social networking sites and development of workshops for teachers. On day three of the Congress, the teams presented their analysis and recommendations, which served as the most important output of the SGAC network. The five 20-minute presentations encapsulating the delegates' fresh perspectives will be gathered into a final report that during the following months to be presented to the United Nations Committee on the Peaceful Uses of Outer Space and to industry, agency, and academic organizations that collaborate with SGAC. SGC's workshop was complimented by series of talks by featured speakers. Dr. Dumitru Prunariu, Chairman of the United Nations Committee on the Peaceful Uses of Outer Space (UN COPUOS) gave the opening talk and set the tone of the Congress by addressing current global challenges and opportunities in the space sector. Other talks included "remote sensing and climate change" by Ray Williamson, Executive Director of Secure World Foundation; "Asteroid Mitigation System" by 'Move an Asteroid Competition Winner' Ben Corbin; Agency spotlight speakers, Barbara Adde from NASA's Space Communications and Navigation (SCaN) Program and Mike Kearny from the Consultative Committee for Space Data Systems (CCSDS); Outreach spotlight speaker Jim Zimmerman, President of International Space Services, Inc; William Watson, Executive Director of the Space Frontier Foundation (SFF); "Rosetta mission" by Berndt P. Feuerbacher, President of the International Astronautical Federation (IAF); Industry spotlight speaker Clay Mowry, President of Arianespace Inc.; and Exploration spotlight speaker John M. Logsdon, Professor Emeritus of the Space Policy Institute of the George Washington University in Washington D.C.